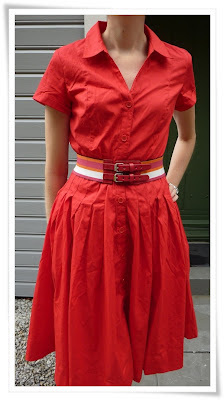 Oh how I love thee, red shirtdress with a full skirt *weeeeeeeeee* Shirtdresses are my best option when it comes to dresses, no doubt about it. :) This red baby sets me on fire *lol* I got it in the sale for next to nothing, Ive also bought the same dress in navy/white dots. This is a great dress on you, definitely worthy of being called "a number." :) Wonderful birthday shoes - it's my birthday this weekend too! - enjoy your party! Okay, now THAT'S the colour of shirtdress I need, not my bland oatmeal dress that I wore yesterday! Love it, and you look amazing in it. The shoes are perfect party shoes! Love them! Hope you have a wonderful birthday. I used to have a pair of black shoes just like those. Fabulous frock, I have a very similar vintage shirt dress. It's a lovely silhouette, and a great colour. Drop-dead gorgeous! That's definitely dream dress material. I love it with the mega-pumps, but the black shoes are also totally perfect. And more appropriate for work. Can't wait to see the other version of that dress. I love the color of your dress. And those tweed heels are so cool! Beautiful! And you've chosen the perfect shoes to go with. Great color dress on you too, especially nice with your fab hair. O MY GOD I am in love with your high heels! Maybe I should not have a shopping restriction after all. Hi there! I just nominated you for a Leibster award. Go to my blog to see what this means. Hello my lovely, you don´t look older than 15. who cares anyway??? You are gorgeous, and I am glad to see you again. We are still 37ºc today. After a long month of cooler weather it is a shock again. I nearly had a heart attack when I saw those heels - gorgeous! The dress is lovely on you, both the colour and the shirt style. The black shoes are nice too, but the pink heels are just incredible! A girl can never be too tall for heels, and if she feels like 25, she IS 25! The red dress is a WOW. I'm agog at the height of your first shoes. I'm lovin' the black pair because I can totally envision them on my feet...lol.